How about a cold one? My production run of the five serving paddles for the beer boots is done. Now it’s time to deliver them to my client to see where they go from here! This type of work is definitely best suited for a production shop with CNC equipment so now he has a sample to show. My design concept turned out as I hoped it would, by using a lighter colored wood than the Cedar server he gave me the rich color of the beer (Fat Tire in this one!) is a nice contrast. Also, the shape of the boot shows up better; with the darker wood and dark amber of the beer everything appeared the same. That effect that would would only get worse in a darkened bar after a few cold ones too! These are made of clear Pine and finished with 5 coats of General Finishes Enduro-Var. This is a water based, polyurethane that should hold up to this use. The initial coats were sprayed on then lightly sanded with 400 grit paper. After drying thoroughly, a final buffing with a white, extra fine, scotch pad completed the job. Now to get them to my client and on to the next project. Currently working on re-webbing the Danish Modern chairs and a carved picture frame. 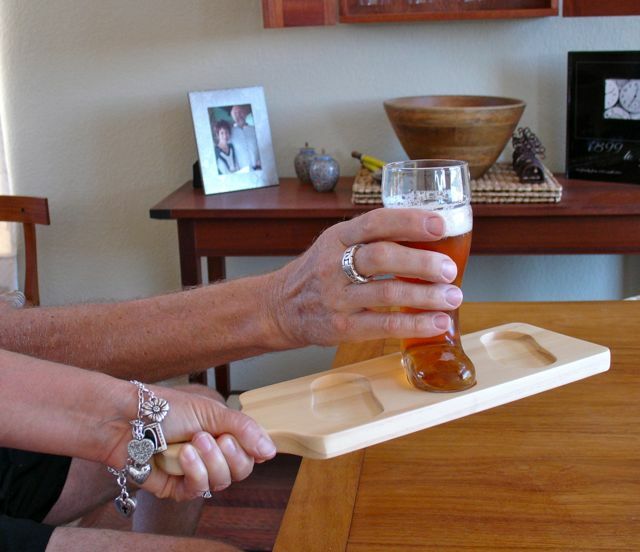 This entry was posted in Uncategorized and tagged beer server, BeerBoot, General finishes EnduroVar, production work, serving paddle. Bookmark the permalink.